Are you on tumbler or using tumbler? If no, then who are you waiting for? And if yes, then I don’t have to say anything as you must watch videos on it and post content to get traffic on website. You can download videos from Tumblr too. Apart from going through the feed, when you watch an amazing video, what would you do reblog it, of course, but how you can share it with others who are not on tumbler. The answer is here with Tumblr video download. Tumblr is similar to some social network platform filled with Giff, photos, and videos. It is also a microblogging platform to share your experience. And you will find all type of videos on Tumbler including funny, weird, and cute. 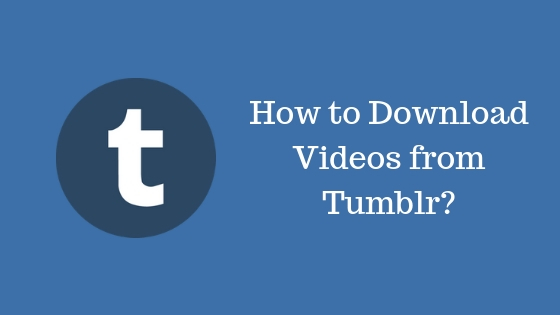 If you wish to download or save Tumblr video share or watch later, then we are here to help you with how to download Tumblr videos guide. Recommended: How To Download an Embedded Video from any Website? 1 How To Download Videos From Tumblr? Note: Keep in mind that these methods are valid for Tumbler platform only. And you can only download video from any of this method. For youtube or Instagram, these strategies will not be useful. If you do not bother to do little extra work, then this method is a much easier way to work as Tumblr video downloader using Google Chrome. By this way, you do not need any third party website or application on your device. Step 1: Open your tumbler feed, and find the video you want to download. Step 2: Next click on the share tab and then on the Permalink button. As you click on it, your video will open in new tab. Step 3: Right click on the video screen anywhere and choose View Frame Source. Step 4: You will see a frame source code page. Here search for the link with the tag “video_file.” To find it press CTRL + F, in the search bar type a proper keyword and enter to find text on a web page. The result shows with a yellow highlight. Step 5: Find the link and right click on it and select “Save Link As” to save the video on your pc or laptop. If you find above method complicated or lengthy, then you can use third-party app or website to download the tumbler video on your pc. Step 1: Go to the tumbler video and click on the share tab and then click on the Permalink button. Now you are on video post tab, copy the video URL from the link. Step 3: On the webpage, you can see a box titled with video URL, paste the link in the box and click on get video. You can also choose the conversion format, and video quality from the page itself. Step 4: Now choose Resolution, format and click on download to save the video. After seeing above two methods, you must have a question that how to save videos from Tumblr from your mobile device, then here is the method. Step 1: If you are using an android device, then open play store and install Tumbloader app on your device. Step 2: Then browse Tumblr video on Tumblr app as usual. Now choose the video which you want to download and click on the share tab and choose Tumbloader as a sharing option. Step 3: It will open the video file in Tumbloader app. Step 4: Click on download tab to download video on your device. Note: If you are using the Apple device, then you can use the Tyblr app. And here you have to log in with your Tumblr account and use the Tyblr app instead of the official app. We do not recommend a third party app, but for iOS user, this is the only way to get the video via the app. So use at your own your risk. So it is all about how to download videos from Tumblr. All the methods listed here is quite easy to share videos on any platform. Make sure you use these methods for sharing purpose only. In case of questions, the comment box is for you, use it. Thank you! thank you for sharing these easy methods.